All CANPEX ULTRA tubing is marked with the name CB Supplies as the manufacturer, nominal size, plastic tubing material designation code PEX 5306 (indicating that the PEX tubing has been tested and meets the F876 requirements for minimum chlorine resistance at the end use condition of 100% @140°F), design pressure and temperature ratings, relevant ASTM standards, manufacturing date and production code, as well as NSF-pw stamps (indicating third-party certification by NSF International for meeting and exceeding performance and toxicological standards, as well as achieving the highest chlorine resistance rating in the PEX industry). NSF conducts random on site inspections of the manufacturing facilities and independently tests CANPEX ULTRA tubing for compliance with physical, performance, and toxicological standards. CANPEX ULTRA is also certified to meet the Uniform Plumbing Code, NSF-61, NSF-14, NSF Annex G (Lead Free), CSA (Canadian Standards Association) B137.5 (cNSF), ULC/UL (Underwriters Laboratory) S101/UL263 and ULC S102 through Warnock Hersey. CANPEX ULTRA provides the many benefits of CANPEX with the added features of proven UV protection. There have been several unsuccessful attempts by PEX competitors to produce a certified UV-resistant PEX product in only 2 layers. CANPEX ULTRA is a PEX product which has proven, documented performance in chlorinated, potable water systems after extended UV exposure. CANPEX ULTRA’s unique multi-layer design provides the durability and performance characteristics that ensure longer more dependable service life. CANPEX ULTRA has proven to be superior in performance in even the most stringent chlorine-resistance testing standards performed on PEX tubing. The manufacturer of CANPEX ULTRA recommends that outside exposure not exceed 60 days. However, based on testing at independent laboratories, even after 6 months of exposure, the product retains its chlorine resistance properties in hot water recirculating systems. 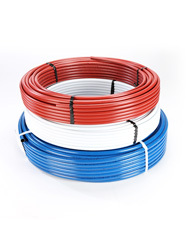 Used in residential plumbing and radiant systems for more than 25 years, PEX has a proven performance record and is growing in popularity within the North American plumbing and radiant heating markets. CB Supplies Ltd. tests its products extemsively at extreme pressures, temperatures and water quality conditions to prove that the claims it makes about the performance of its pipe are accurate. Highest Quality Products CANPEX ULTRA is made using the Silane method of cross-linking. This method produces tubing that is the most consistent in size, dimension and degree of cross-linking, which, when combined with premium raw materials, helps produce the highest quality products possible.